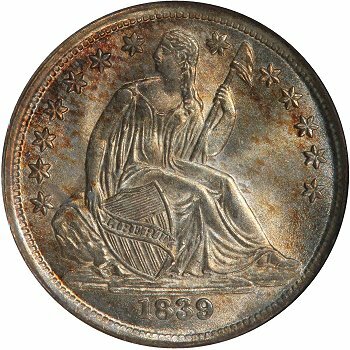 During October 2009, the PCGS registry staff lead by BJ Searls launched new registry sets that comprehend major varieties within individual coinage series. 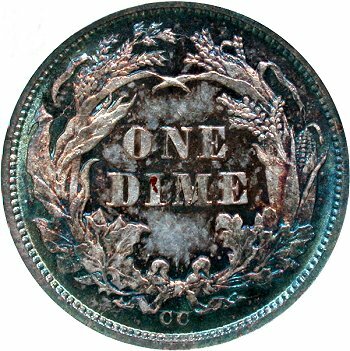 These sets were defined as "Complete Variety Sets" and featured varieties defined in the Cherrypickers' Guide by Bill Fivaz and J.T. 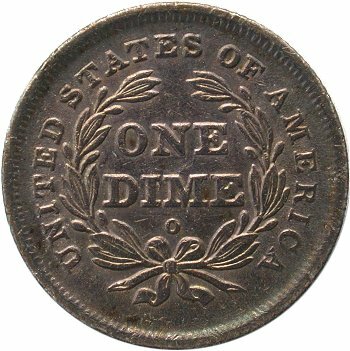 Stanton. 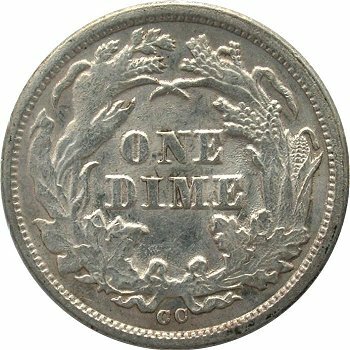 Following is a detailed cross reference guide for the Liberty Seated Dime variety collectors who may wish to attribute their coins to the Cherrypickers' Guide variety listings and also be able to properly reference the associated PCGS certification number. 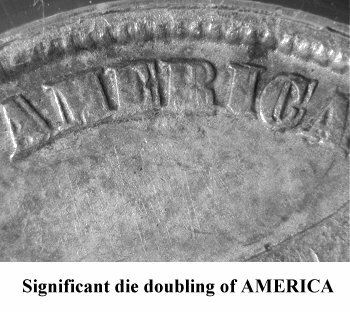 Additional cross referencing to the Fortin numbers and web-book descriptions are provided to simplify the attribution process. 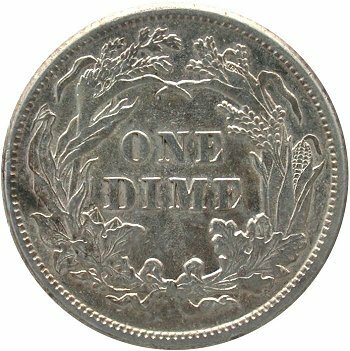 Finally, a quick scan Pictorial Guide is provided to further simplify attributions. 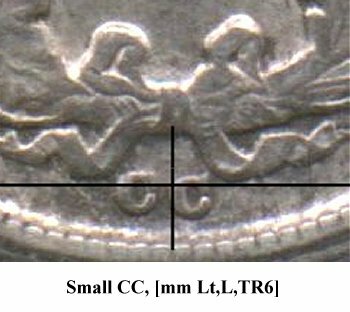 Several of the Cherrypickers' varieties have inconsistencies with illustrations in the guidebook. 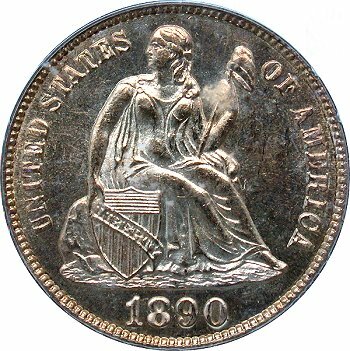 Those situations are discussed and suggestions made for selecting the actual variety to be certified and included in the PCGS Complete Variety Set. 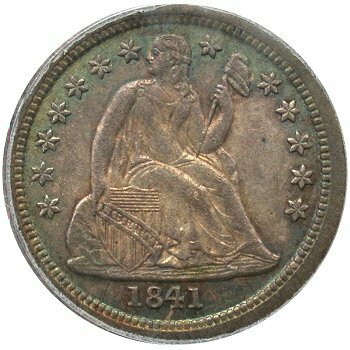 Click on the underlined Fortin Variety number to see images and web-book descriptions for each PCGS/Cherrypickers' Guide variety. 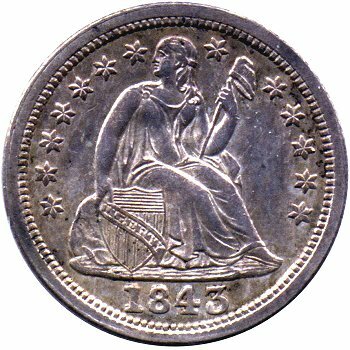 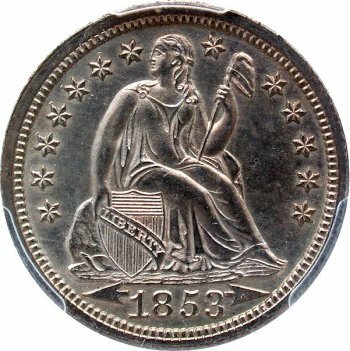 The reverse die paired with 1838 Small Stars obverse re-used with Large Stars obverse die. 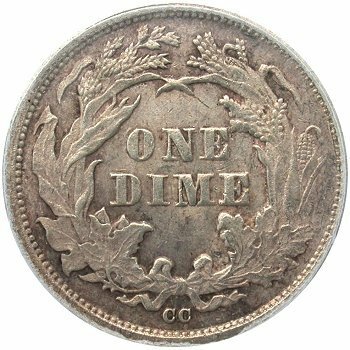 This variety has received little if any publicity and is not popular with Seated dime variety collectors. 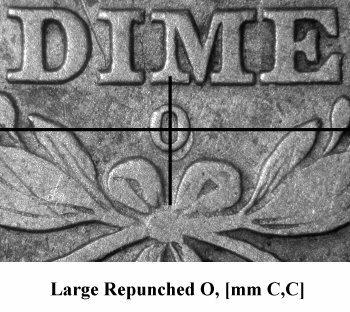 The Large O mintmark is strongly repunched. 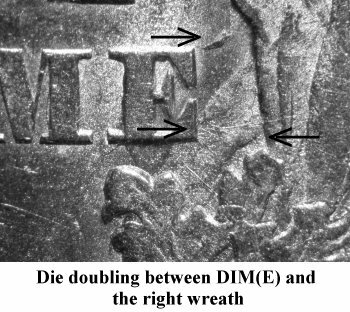 Two die states can be located; without and with a bisecting horizontal die crack through left wreath, DIME and right wreath. 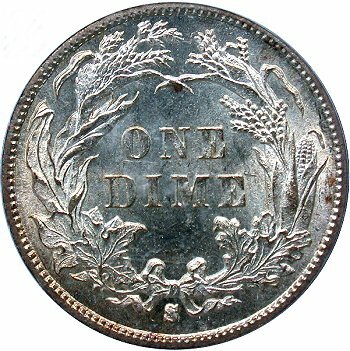 The latter die state (F-104a) is one of the Fortin Top 100 Varieties. 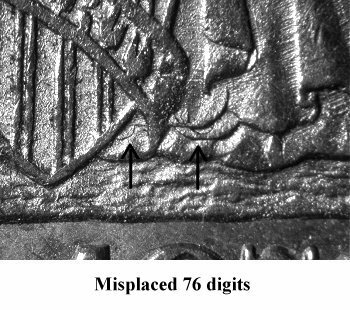 For PCGS registry, only the repunched mintmark is required. 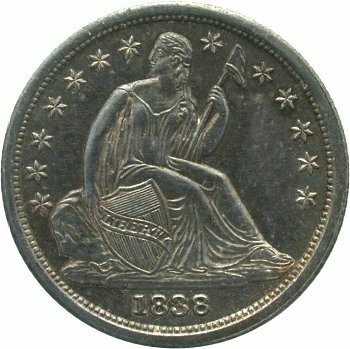 Small O mintmarked reverse die from 1840 with Closed Bud wreath design paired in January 1841 with new 1841 With Stars obverse die. Both Large O and Small O Closed Bud examples are struck from the same 1841 obverse die. 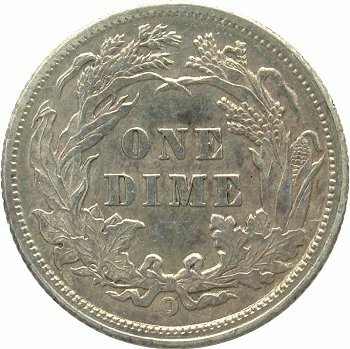 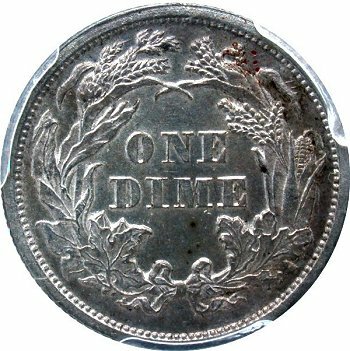 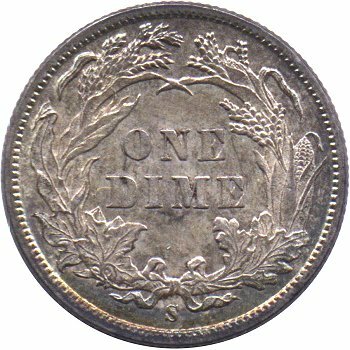 The variety is transitional and highly sought after by Seated dime variety collectors. 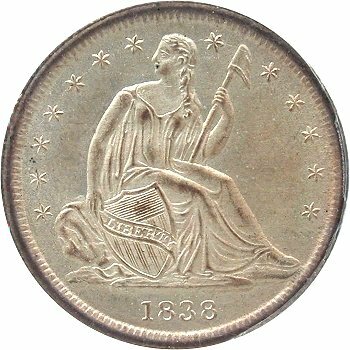 Large O mintmarked reverse die from 1840 with Closed Bud wreath design paired in January 1841 with new 1841 With Stars obverse die. 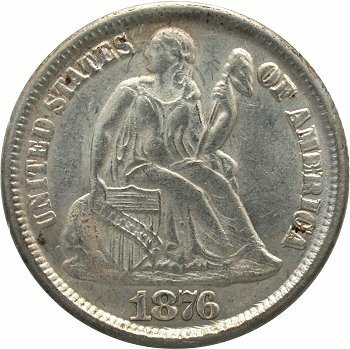 Both Large O and Small O Closed Bud examples are struck from the same 1841 obverse die. 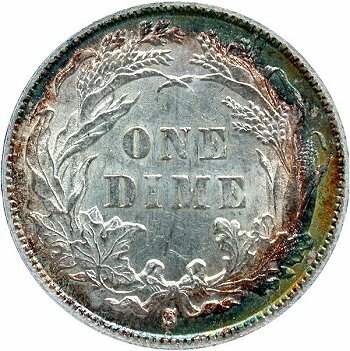 The variety is transitional and highly sought after by Seated dime variety collectors. 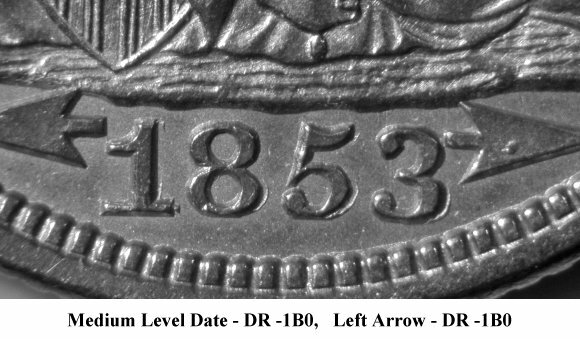 Nicely defined repunching is visible on all 1843 digits. 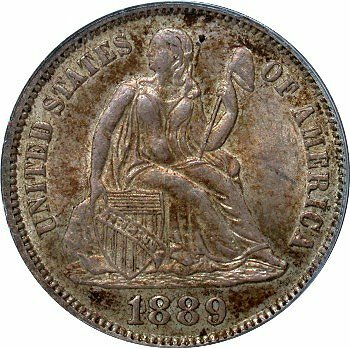 This variety is well established and popular with collectors. 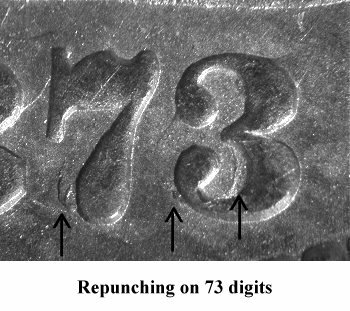 Repunching is visible to the right of all four date digits. 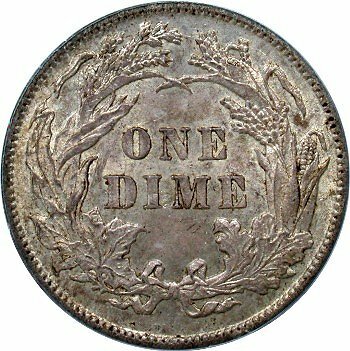 This is another well established variety that is popular. 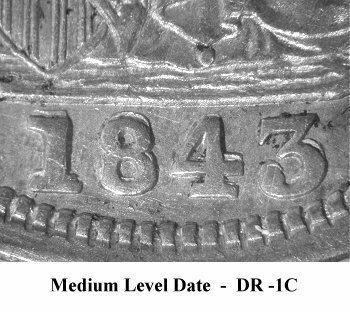 Please note that 1853 WA obverse dies come with hand punched date digits and arrows (Unhubbed) and fully hubbed date digits and arrows in the working hub die. 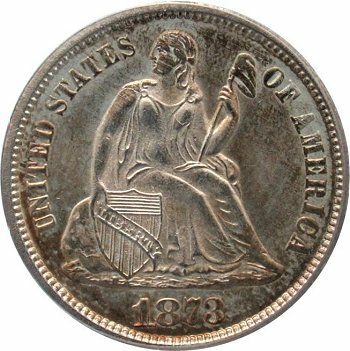 There are inconsistencies surrounding this variety due to difference between Greer and the Cherrypickers' Guide. 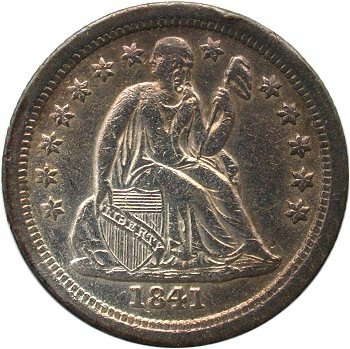 Cherrypicker references the variety as Greer 101 (Doubled East), however the Cherrypickers' Guide uses an illustration of another 1856 DDO variety (Doubled North). 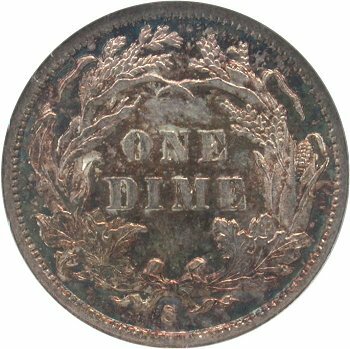 I've chosen to associate FS-1101 with F-108 which is the Doubled East variety and will consult with PCGS to ensure there is alignment on the proper DDO that qualifies as 145489. 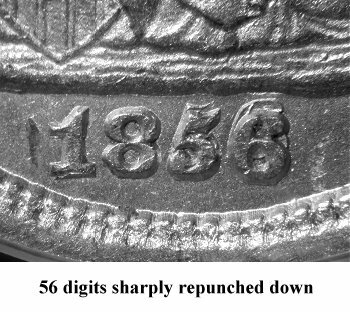 Bold repunching is visible above the 56 digits. 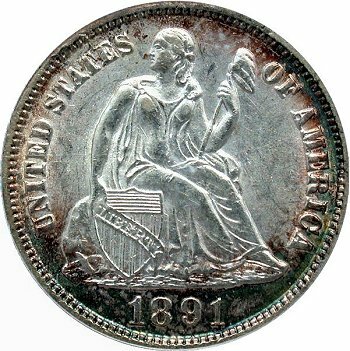 This obverse is quite rusted and is paired with a Large O reverse die. 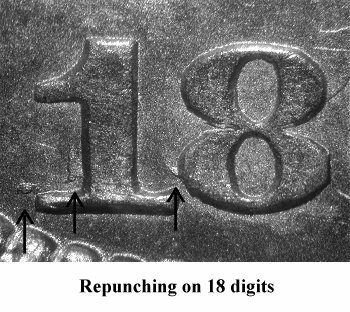 A weaker secondary date punch is visible within the 18 and 2 digits. 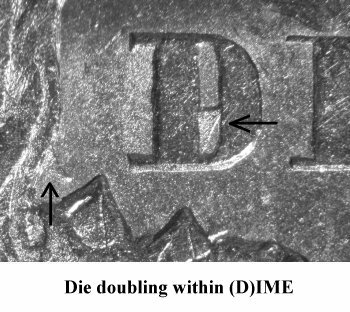 A dramatic doubled reverse die with second hubbing being 170 degrees rotated from the first. 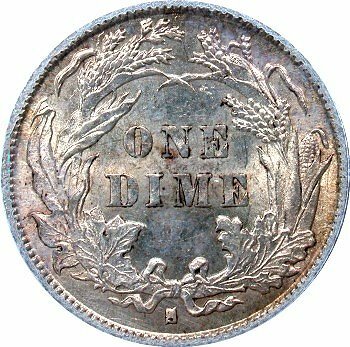 This is a popular variety with collectors. 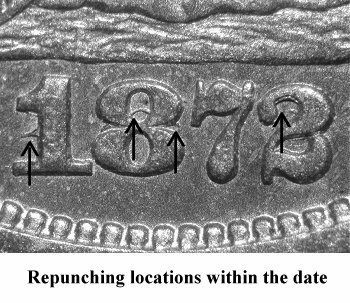 Repunching is obvious at the bottom left of each date digit. 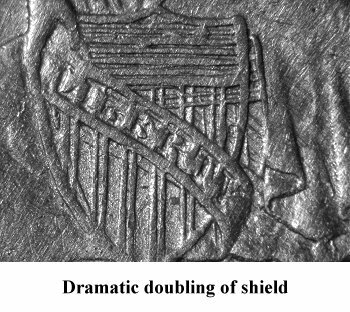 The obverse is strongly doubled on the shield and on the banner across the shield. 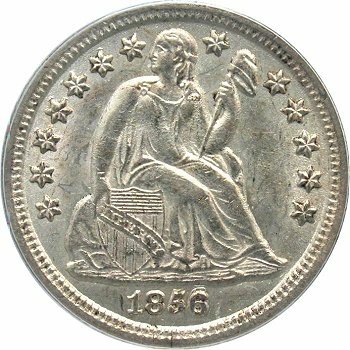 This is a rare variety in higher grades but occasionally cherrypicked in lower grades. 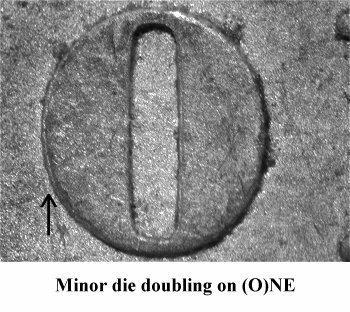 The top of a 1 digit is clearly protruding from the denticles directly below the 8 digit in the date. 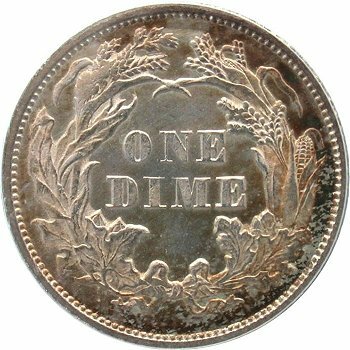 This variety is very popular and quite scarce. 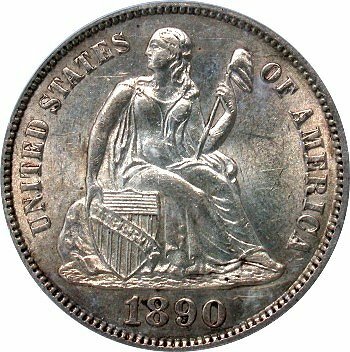 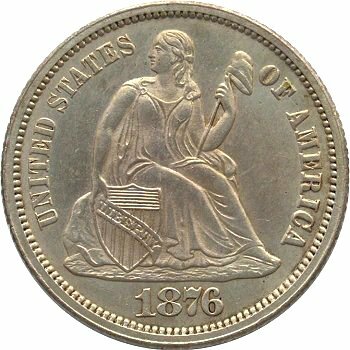 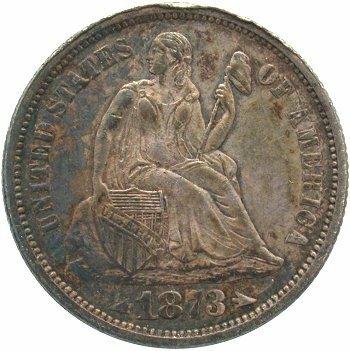 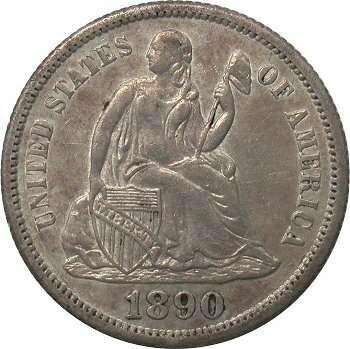 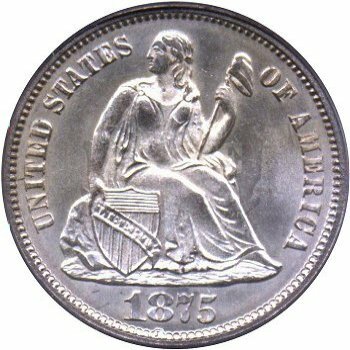 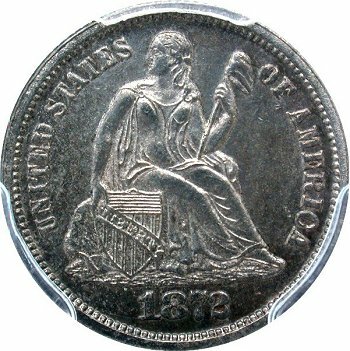 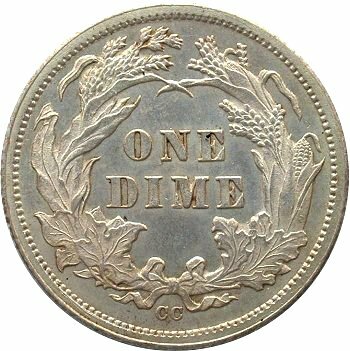 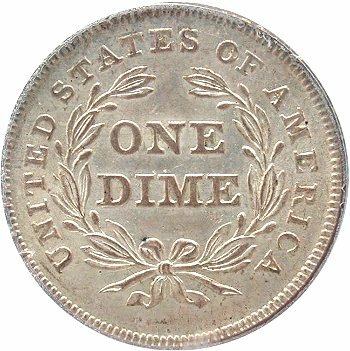 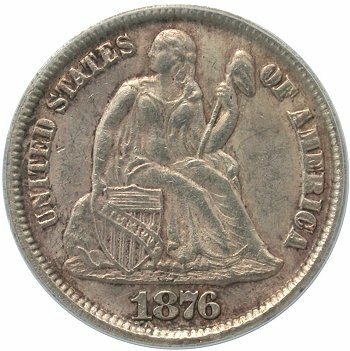 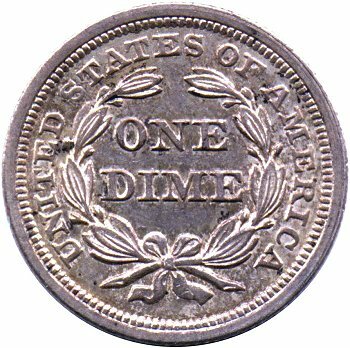 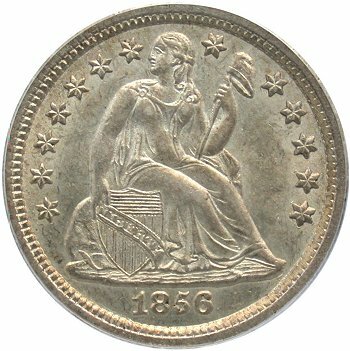 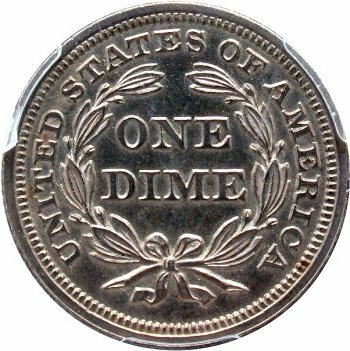 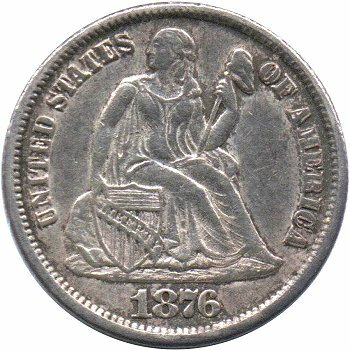 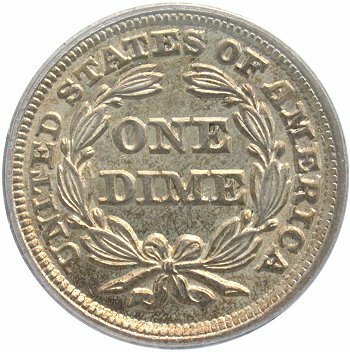 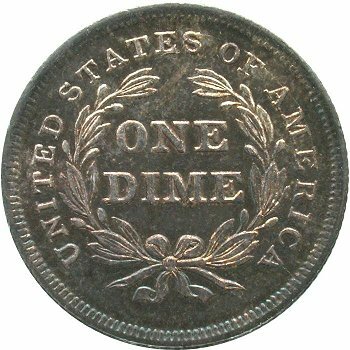 An 1876-CC obverse die exhibits strong doubling on OF AMERICA. 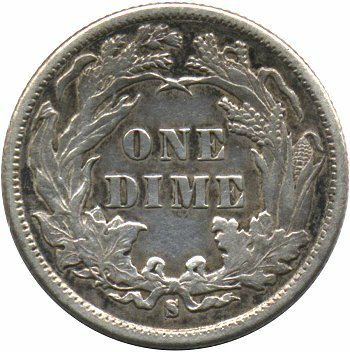 This obverse die was paired with three different reverse dies until completely eroded and no longer suitable for coinage. 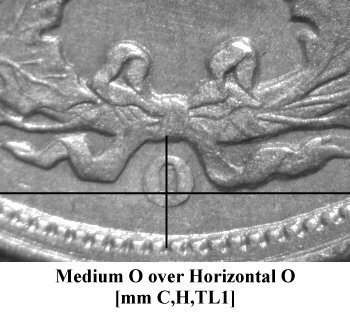 The three reverse dies can be identified by different mintmark positions. 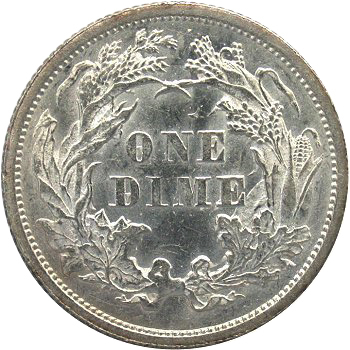 The FS-101 variety results from second reverse die to be paired with doubled obverse die. 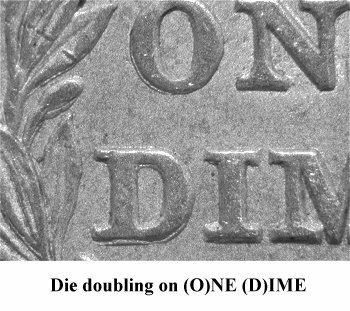 The FS-102 variety results from third reverse die to be paired with doubled obverse die. 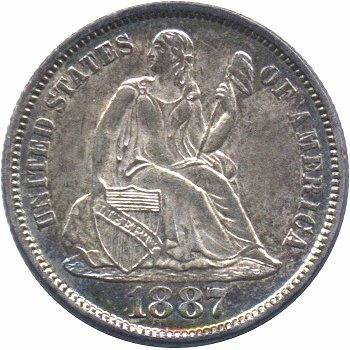 This pairing is most available with examples showing substantial obverse and reverse die erosion. 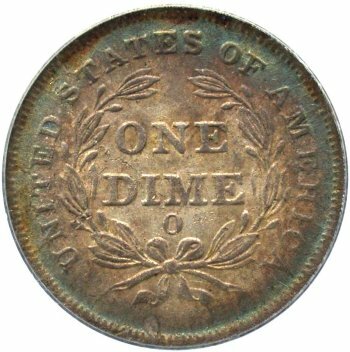 The FS-103 variety results from first reverse die to be paired with doubled obverse die. 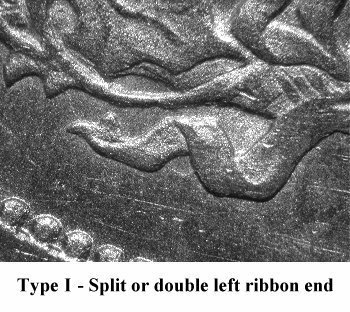 This pairing is the most difficult to locate but specimens are nicely struck. 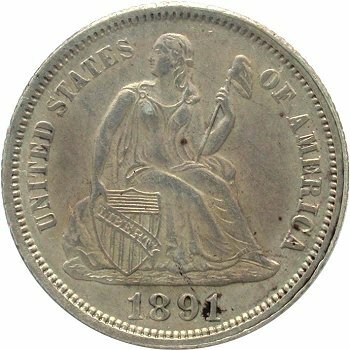 A single reverse die with Type 2 reverse design was used to strike 1876 Carson City coinage. 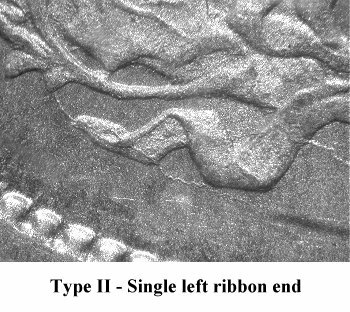 The Type 2 reverse is easily diagnosed by checking the left ribbon end. 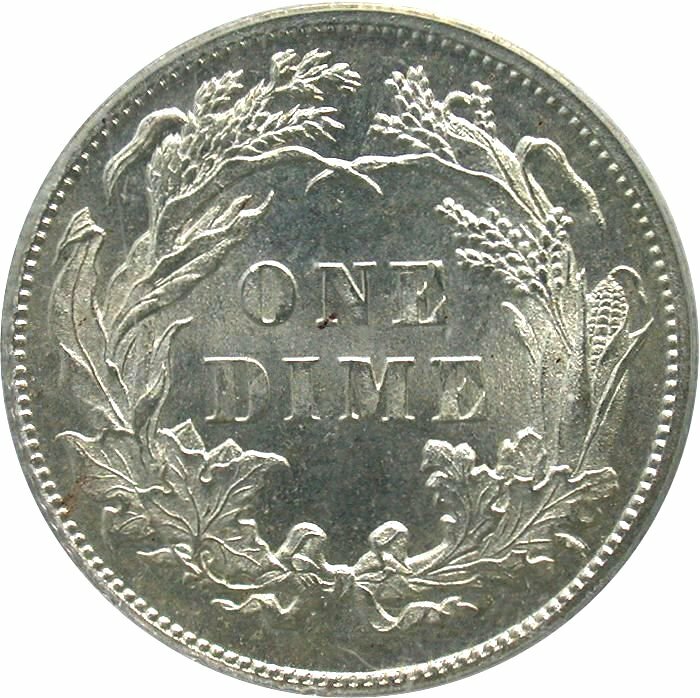 If single pointed, then Type 2 reverse design. 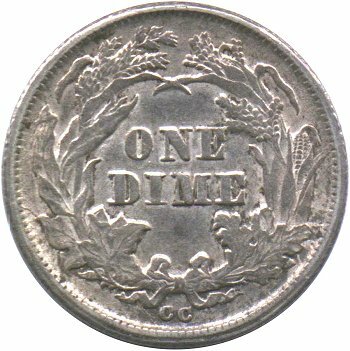 If double pointed, then Type 1 reverse design. 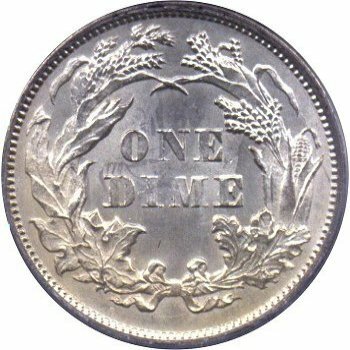 This Cherrypickers' variety is confusing. 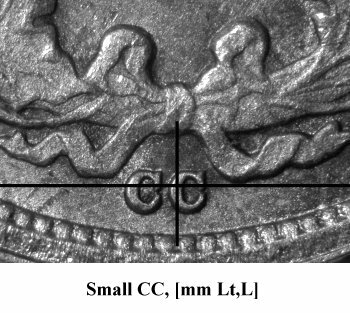 Greer identifed two different 1887-S repunched mintmarks based on Wexler and Miller. 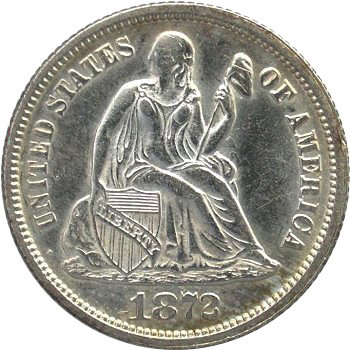 The Cherrypickers' Guide illustrations shows neither and is in error. 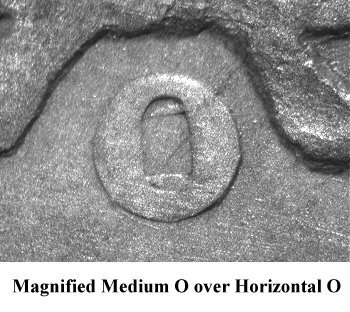 I've chosen to cross reference Greer 102 since it appears as CONECA RPM 2. 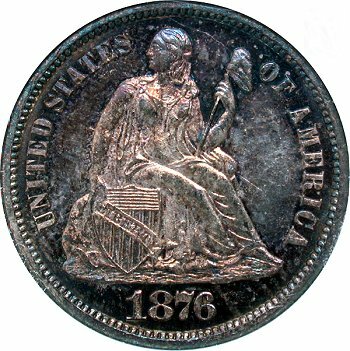 Discussion with PCGS on proper attribution is necessary. 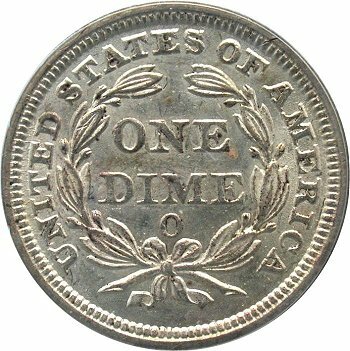 Repunching can be seen on the left side of the mintmark between the upper loop and top tail of the serif and secondly, below the final serif. 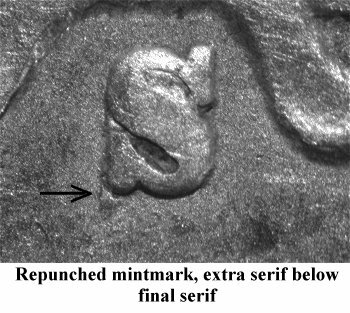 The repunching below the left serif is the primary diagnostic for identifying this variety. 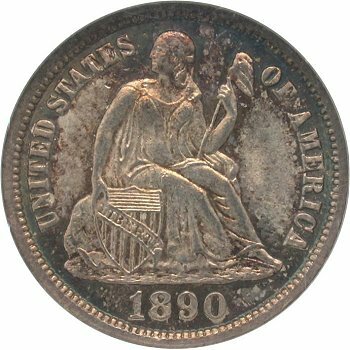 Five different 1889 reverse dies have been documented with doubling at www.seateddimevarieties.com. 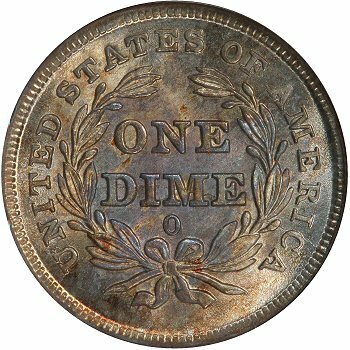 I've chosen to cross reference Cherrypickers' FS-801 with the F-105 variety and Double Die Obverse #2 based on the illustrations in the Cherrypickers' Guide. 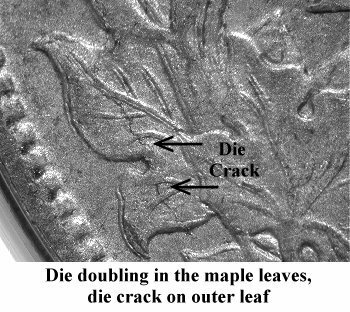 The is doubling within the wreath leaves and and an obvious die crack in the same area. 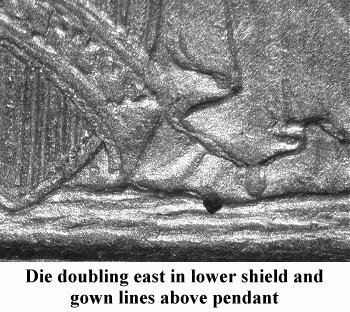 The top of an 8 or 9 misplaced date digit is evident in the gown to the right of the shield and scroll. 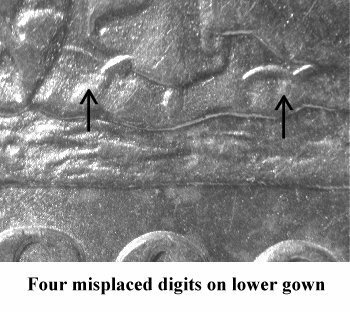 The top loops of four misplaced digits are visible in the lower gown. 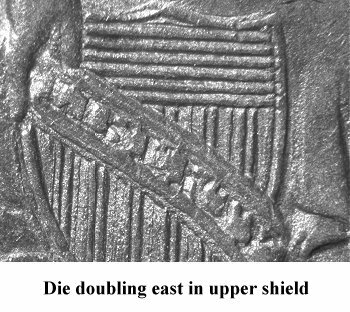 The left and right outer digits appear to be the top loops of an 8 and 0 digits. 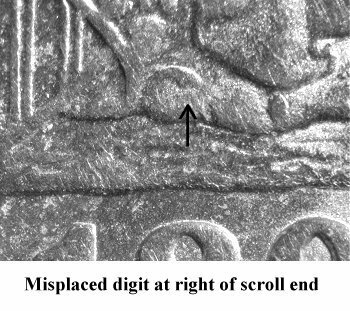 These two outer digits are positioned directly above the final date punch. 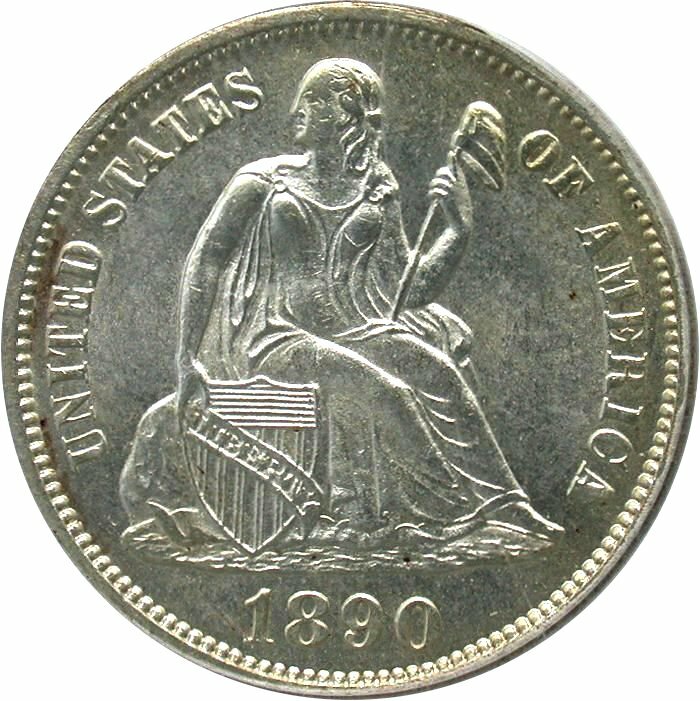 The two inner misplaced digits appear to be the top loops of an 9 and 0 punch. 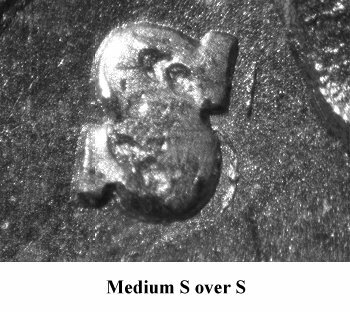 The right outline of the earlier Medium S punched mintmark is very visible to the right of the final Medium S. The upper loop of the first S mintmark is also clearly visible within the upper loop of the final S. This is a scarce variety. 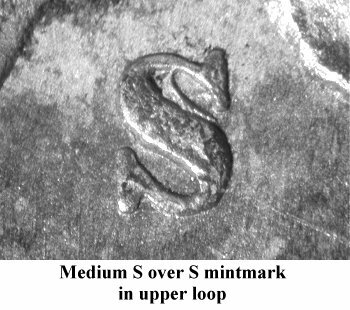 The artifact in the upper loop of the Medium S mintmark has been designated as the remnants of a Small S mintmark in the Cherrypicker's Guide.. After close examination of the Medium S mintmark on several examples, I am not completely convinced that this variety is a Medium S over Small S mintmark. 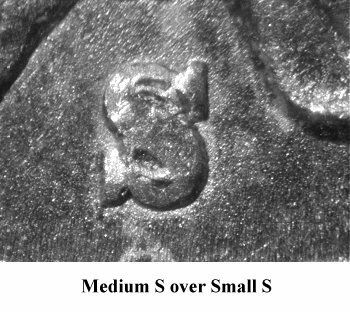 The lower loop of the Medium S does not show any evidence or remnants of a Small S mintmark. 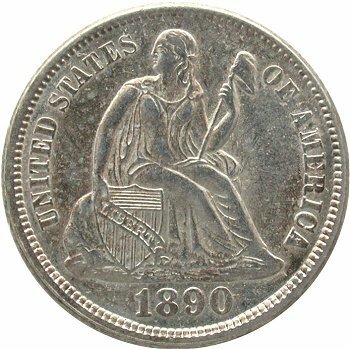 There are two 1890-S reverse dies punched with a Small S mintmark. 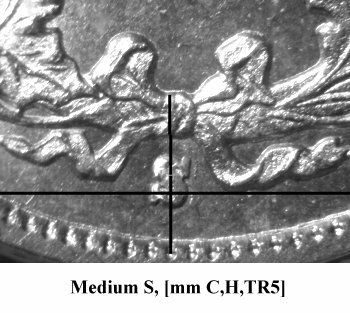 On the F-105 reverse, the Small S is center between the ribbon ends while on F-108, then Small S is positioned well left. 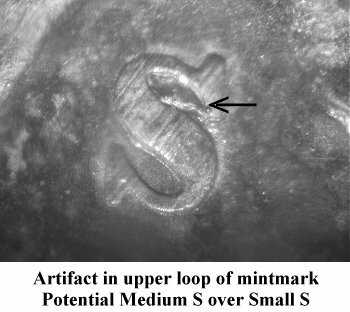 Either mintmark locations are difficult to locate. 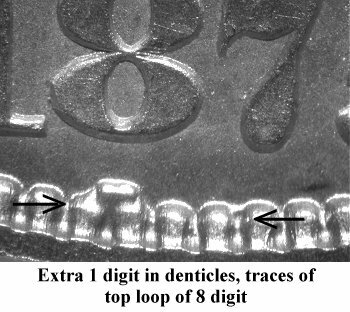 The top loop of an 8 or 9 digit is visible in the denticles at a point below the 8 and 9 date digits. 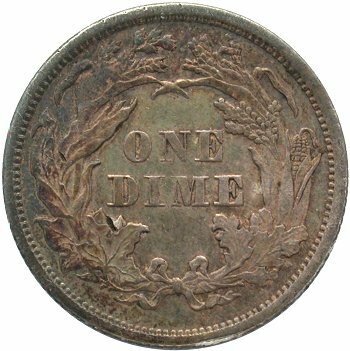 This variety is classified as a primary New Orleans mintmark punched over a previously punched horizontal O mintmark. 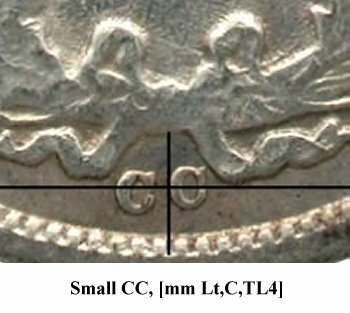 A well known variety due to the easily detected Medium S over Small S mintmark.